For a really long time, I refused to "read" anything unless there was an audio option. When it comes to story types of books, fiction and non-fiction, that's still true. Audiobooks are awesome for many reasons, and still my preference. However, there are some books that just make sense to read, re-read, take notes, and reference later. In that situation, audiobooks don't work - trust me, I tried. I listened to The 4-Hour Work Week while riding a bike behind Jessi while she trained for the Portland Marathon. When we finished I would hop online to find some resources I could copy notes from. I did the same thing with Made To Stick - a fantastic book and one I've almost bought a hardcopy of multiple times. My review was my way of creating notes from what I heard. Anyways, I've learned that how-to types of books are best read with my eyes. My preference are Kindle books because I can take notes and reference it later. Plus, they don't take up any additional room, are always with me, and often cheaper than the paper version. That's how I read 9 Marks of a Healthy Church by Mark Dever. The title explains what the book is about pretty well. Dever first delivered the 9 marks in a 9-part message series and eventually turned it into a book. The intent was not to cover every single aspect of a church (you'll notice he doesn't mention prayer, but it's still important), but instead talk about those marks that distinguished healthy churches. What are the 9 marks? Glad you asked. What follows is a lot of quoting because in a lot of ways the whole book is a summary of what the Bible is teaching us. Plus, each of these are meaty topics, so I felt the need to include a lot to do it justice. Here we go! This is the most important mark. Our faith is based on Scripture, and we need to spend time trying to understand what Scripture is telling us. "Expositional preaching is not simply producing a verbal commentary on some passage of Scripture. Rather, expositional preaching is preaching that takes for the point of the sermon the point of a particular passage of Scripture." So instead of choosing a topic and finding Scripture to support that topic. You first choose a passage and let God reveal it's truth to you. In a healthy church, the majority of messages will be taught expositionally. The first mark is how we should be taught. The second mark is what we should be taught. The messages should fall in line with what the Word of God actually teaches, especially when talking about the nature and character of God. "Five words summarize what the Bible teaches us about God: he is creating, he is holy, he is faithful, he is loving, and he is sovereign." As for Jesus, "He came as the One by whom you and I can have a restored relationship with God. He is the One from whom God's people had long been waiting. Where Adam and Israel had failed and been unfaithful, Jesus survived temptations without sin... Jesus Christ is the faithful fulfillment of God's promises." Of course, the only real way to know if what you're being taught is true, is to also be studying Scripture yourself and praying "for leaders in the church to have a biblical grasp of and an experiential trust in the sovereignty of God." "The good news is that the one and only God, who is holy, made us in his image to know him. But we sinned and cut ourselves off from him. In his great love, God became a man in Jesus, lived a perfect life, and died on the cross, thus fulfilling the law himself, and taking on himself the punishment for the sins of all those who would ever turn and trust in him. He rose again from the dead, showing that God accepted Christ's sacrifice and that God's wrath against us had been exhausted. He ascended and presented his completed work to his heavenly Father. He now sends out his Spirit to call us through this message to repent of our sins and to trust in Christ alone for our forgiveness. If we repent of our sins and trust in Christ we are born again into a new life, an eternal life with God." "from worshiping ourselves to worshiping God, from being truly guilty in ourselves before God to being forgiven in Christ... It's all about realizing that we can never go to church enough, we can never teach enough Sunday school classes, we can never give enough money, we can never be kind enough or beautiful enough, or happy and contented with our religious lives enough to merit God's good will towards us... Our only hope comes in understanding that God has taken on flesh in Christ, that Christ lived a perfect life and died on the cross in the place of all those who would ever turn and trust in him, and that he rose in victory over our sins and now offers to pour out this Holy Spirit into our hearts. Beginning to have this reliance, this trust in God alone, is the nature of the great change that takes place in conversion. We must repent of our sins and trust in Christ." This conversion comes from the preaching and listening to the Word of God, the Good News. If you haven't noticed yet, each mark builds upon the others. What is Evangelism? "First, you must understand that the things you believe in as a Christian are facts. They are not mere beliefs or opinions. Second, these facts are not yours in the sense that they uniquely pertain to you or your perspective or experience, or in the sense that you made them up on your own. When you evangelize, you are presenting God’s truth. Finally, in biblical evangelism we don’t impose anything. We can’t. According to the Bible, evangelism is simply telling the good news; it does not include making sure that the other person responds to it correctly." Evangelism is "the positive act of telling the good news about Jesus Christ and the way of salvation through him." That's it. It's not the results. It's not our job to convert people; that part is left to God. Dever also includes many resources to help people evangelize since we're all commanded by Jesus to do it, but the basic idea is to share the Good News, use the Bible, and let God change their heart. "A church is a local collection of people committed to Christ, to regularly assemble and have his Word preached and obeyed, including Christ's commands to baptize and to celebrate the Lord's Supper... The responsibilities and duties of members of a Christian church are simply the responsibilities and duties of Christians. Church members, like Christians, are to be baptized and to regularly attend the Lord's Table. We are to hear God's Word and to obey it. We are to regularly fellowship together for mutual edification. We are to love God, one another, and those outside our fellowship, and we are to evidence the fruit of the Spirit (Gal. 5: 22– 23). We are to worship God in all the activities of our home, work, community, and life... We must view membership less as a loose affiliation useful only on occasion and more as a regular responsibility, becoming involved in one another's lives for the purposes of the gospel." As members we are called to attend services regularly, take communion together, pray regularly, and give regularly of our time and possessions. Often times we're told not to judge people, but that isn't completely Biblical. Instead, "we are told to judge ourselves (1 Cor. 11: 28; 2 Cor. 13: 5; Heb. 4; 2 Pet. 1: 5– 10). We are also specifically told to judge one another within the church (though not in the final way that God judges)... After all, if we cannot say how a Christian should not live, how can we say how a Christian should live?" To be clear, this is NOT a holier-than-thou type of judging. Instead, it's trying to help each of us measure up to God's holiness. Furthermore, discipline is not about revenge or getting back at someone. Instead, "we should discipline with humility and in love for God and for the person disciplined." When I discipline our dog, Vinnie, I imagine him sometimes coming to me asking if I still love him even though I put him in timeout. And my mental response (OK... I do talk to him out loud...) is that I disciplined him because I love him. Church discipline must be the same way. Growth is Biblical. God repeatedly commands people to be fruitful and multiply. "Then God blessed Noah and his sons, saying to them, 'Be fruitful and increase in number and fill the earth' (Gen. 9:1)." "The New Testament idea of growth involves not just more people, but people who are growing up, maturing, and deepening in the faith. We read in Ephesians 4: 5-16: "Instead, speaking the truth in love, we will in all things grow up into him who is the Head, that is, Christ. From him the whole body, joined and held together by every supporting ligament, grows and builds itself up in love, as each part does its work." How does such growth happen? Ultimately, it happens by God's work. We grow as the body of Christ as God causes growth. According to Colossians 2: 19, Christ is "the Head, from whom the whole body, supported and held together by its ligaments and sinews, grows as God causes it to grow." It is not the preacher who causes a church to grow." In what particular ways have you grown in your understanding of the Christian life? How have you grown in your practice of the Christian life? In what particular areas do you feel that you need instruction? Are you disappointed in your own pursuit of holiness? If so, explain. How, specifically, can I pray for you? Now that's accountability that'll lead to growth! The church is a monarchy, with Christ as the king, and the church exists only as the people in it continue to participate in its activities. Those actives include attending, praying, giving, and getting to know the church family. The church should also have leaders, called elders. "All churches have had individuals who performed the functions of elders even if they haven't used that word for them. The two most common New Testament names for this office are episcopos (overseer) and presbuteros (elder)." There is also a main preacher, or senior pastor, who is also an elder. These should be men of good character, of good reputation, able to handle the Word, and have demonstrated fruit of the Spirit. They are also to be focused on others, irreproachable, not violent, not greedy, and not a recent convert. 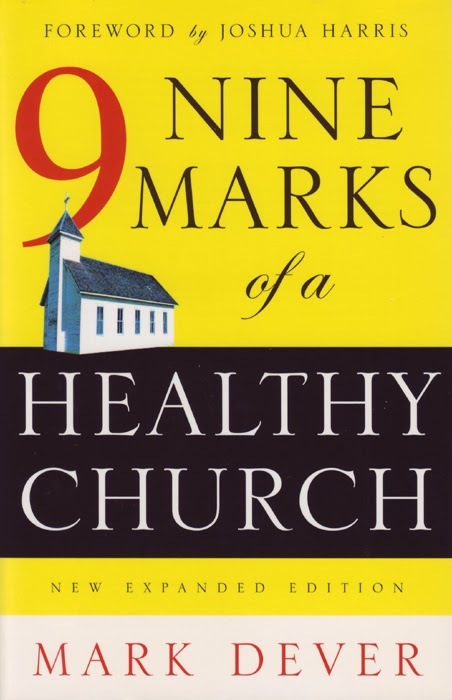 Finally, a church leader is someone who understands and strives to carry out the 9 marks of a healthy church. Wow - now that's review! I still recommend you read the book because Dever goes into much more detail and does a fantastic job of back up everything he says with Scripture.